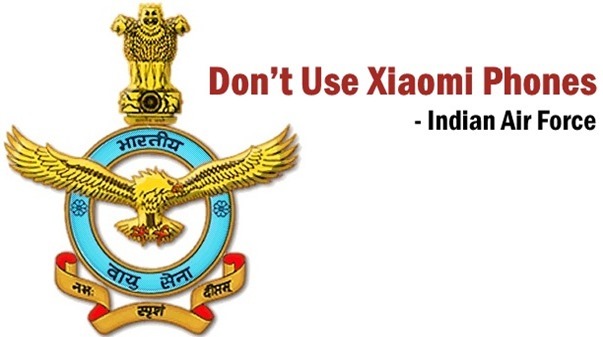 Labeled as a ‘Medium Severity Rating’, which is considered quite a threat to national security, Indian Air Force (IAF) has released a fresh warning against using Xiaomi mobile phones. This warning was presented via a note released by IAF, and is meant for Air Force personals and their family members. The note quotes a security article shared by F-Secure wherein it was found that their mobile phones is automatically “forwarding carrier name, phone number, IMEI (the device identifier) plus numbers from address book and text messages back to Beijing”. Further in the note released by IAF, the case of Hong Kong user has been cited in which the user had shown how data from Xiaomi mobiles transfers personal data to an IP based in China. The note concludes by warning as Air Force personals and family members against using Xiaomi mobiles considering the threat to national security. It seems that security woes of Xiaomi mobiles is far from over. This July, Doctorate General of Military Operations of the Indian Army had issued a similar warning against Xiaomi, when they said that every Internet and Telecom company in China is liable to share user’s data with their government and hence using their mobile phones is risky. Especially mentioned in that warning were family members of those who are in Defense research as once the data is sent to the Chinese Government, they can do some serious experiments, the details of which need not be explained to gauge the implications. Although Xiaomi later clarified and explained their stand on the matter, and ensured that no such unauthorized data transfer is taking place. They also shared method to stop auto-synchronization of data and provided complete explanation of the process, which actually happens with almost all manufacturers of phones. As per Tech Crunch, a leading publication on tech industry, Xiaomi is even considering shifting their data servers out of China, to assure those who are afraid of strict Chinese policies related with user’s information. Not only it will save them bandwidth and improve data access, this move will also assist in gaining confidence among skeptical users. Although the latest warning issued by IAF against Xiaomi doesn’t contain any new research or investigation which suggests that data is actually provided to Chinese Government, but it’s a warning none-the-less, that too from a leading National defense organization. Xiaomi hasn’t responded this fresh salvo against them. We will keep you updated on this news. After Indian Air Force Issued a warning, Xiaomi’s Hugo Barra has said in a Google+ post that they are moving their data out of China and moving to new servers. Here is the complete unedited post by him. "Don’t Use Xiaomi Phones, Warns India Air Force [Updated]", 5 out of 5 based on 1 ratings. It’s Air Force “personnel”, not “personals”.